Students will receive a certificate and candy in honor of their superlative. 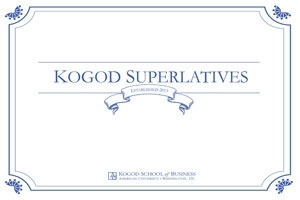 From "Best Networker" to "Most Likely to Make the Forbes 500 List," students nominated members of the class of 2013 for lighthearted superlatives, with an eye on the upcoming May 12 commencement. Student winners will receive a certificate with the honor and a prize of sweet treats.